Finally a Recruit Update where I can give an update on recruits. Shane Walsh and Kenny Gillespie both returned to action this past week after spending over a month plus injured. Gillespie didn’t register any points in his return for the Lancers, playing in one game. The Pics played in a Winter Showcase event in Marlboro over the weekend. Smith ended up playing in four games total, two for the EJHL team, two for the Empire team. He picked up two assists on the weekend, one for each level. It’s an exhibition event though, so no updates to the totals above. Walsh picked up an assist as he returned to the ice for the Saints for a couple games this past weekend. Also on the recruiting front, I’ve learned that Massachusetts has offered a scholarship to Kimball Union defenseman Joseph “Doyle’” Somerby. The biggest positive for Somerby is his size; 6’4” and 210lbs. And given the fact that he’s only 17, that size could increase. I think he would probably be a 2014 if he were to commit. According to what I’ve heard he has a number of schools after him, including some Hockey East schools. USHR reports that he’ll likely make a decision by the end of the season. It might not hurt that he’s from Marblehead, Toot Cahoon’s hometown. From the little research I’ve been able to do the scouting reports are really mixed. I read one account that said he’s a poor skater. But USHR says the opposite. Overall though it appears his biggest positives are his size and his stick handling. It seems that he has a lot to work on in regards to his game, but he also has time to do so. He is considered a “Player to Watch” for the 2012 NHL Draft as a mid-level prospect. Somerby is on a defensive pairing with Alex Carle, brother of NHLer Matt Carle. Alex is expected to go to Denver like his brother did. UMass has found quality players from the prep leagues before, but rarely at defenseman. In recent years forwards like Mike Pereira, Conor Sheary, and Will Ortiz have all made huge contributions. And the team has gotten quality goaltending from the preps in the form of Steve Mastalerz or some guy named Jon Quick. But I can’t think of many defensemen coming to Amherst from the prep league. That’s not to say they’re not there, Hockey East and the ECAC have gotten top defensive talent from New England preps. It just seems the UMass coaches have gone for the other positions. Co-Captain T.J. Syner, currently tied for third in points among Hockey East players, is UMass’ lone candidate in the fan voting for the Hobey Baker Award. So, in honor of today’s New Hampshire primary, please feel free to vote early and vote often. Speaking of voting, you’ll notice a new poll on the right of the blog. To the frustration of some UMass fans, it does not appear that replica of the jerseys the team wore at Fenway will be made available to the public. Instead the word at the game was that a select number of gameworn jerseys will be sold in a process to be determined later for a rumored price of $500 apiece. As a UMass gameworn jersey collector, I have no problem with the jerseys worn by the players going for such a high price, assuming the demand will be there. However I, like other fans posting on UMasshoops, think not offering more affordable replicas is yet another miss by the UStore or Licensing or whoever makes the decisions to create UMass things that people want to buy. So I created this poll, mostly out of curiosity, to see how many people would actually want to buy a replica of the “M” jerseys. I can’t promise anything will come of it, but it’s interesting to see. Also, if you’re wondering why the answers are split around the $100 price point, that’s what Vermont is selling their replica Fenway jerseys for. Regarding the jerseys themselves, while I thought they were a little loud and perhaps unoriginal when I first saw a picture of them, seeing them live and also on the replays I think they look spectacular in action. I hope to see more of them in some way, shape, or form somewhere down the road. In his “Three Things I Think” Joe Meloni doesn’t think much of UMass’ recent success. Maybe he’s just over compensating so he doesn’t become the second UMass alum to gain the attention of the boys over at Ice is Life. Speaking of other blogs, nice to see The Guys of the Fight Mass Show Starring the Fight Mass Guys are men of their word. Halfway through the NHL season, Jon Quick is getting a number of accolades. Quick is picked as the top Vezina candidate by Yahoo Sports’ Nichloas Cotsonika and the best NHL blog out there, Yahoo’s Puck Daddy, and is considered a finalist by NHL.com’s Dave Lozo. College Hockey News has a must read piece on the major junior versus college debate in the wake of recent departures. One last bit of news. 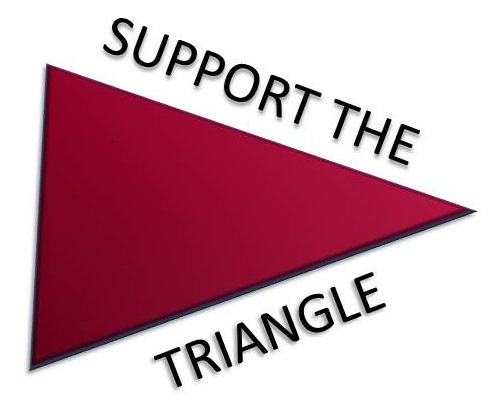 A few years ago I started Fear The Triangle to help distract me from a job I hated (and have since replaced with one I love) and combine my enjoyment of UMass hockey and writing, which I hadn’t done much since my college days as a history and polisci major. My interest in the hockey team led me to do a lot of reading on not so readily available topics like recruiting and the pairwise. So, I figured I might as well share all that UMass hockey news and info that was rattling around in my head with others who also had interest in the subject. Thus Fear The Triangle was born. But along the way, something strange happened. People actually started reading this thing. Not just my buddies in Section U. But UMass fans, alumni, students, and parents. And then fans from other schools and college hockey media folks started reading as well. From there, thanks to the blog, I’ve been able to meet a ton of people I probably wouldn’t have otherwise. I’ve been able to have excellent hockey conversations from Madison, Wisconsin to some of the finest sports bars in Boston. I now find people addressing me as “Fear” or, in more formal settings, “Mr. Triangle”. I’ve been able to stand side by side with real media members whose work I respect and read religiously. And I even had a chance to attend an official press conference at Fenway Park as a member of said “media” (though I will always make sure to distinguish myself as a fan blogger versus the men and women who actually know what they’re doing). That said, this week, like attending a press conference in hallowed grounds like Fenway, could bring something I never would’ve imagined myself doing just three years ago. This Friday prior to NESN’s coverage of Boston University-Northeastern, I’m currently scheduled to join the pregame broadcast by phone to discuss that night’s UMass-Boston College matchup. It is terrifyingly exhilarating for someone just writing a fanblog for fun. I have no idea if it will actually come to be, but the prospect is something I never would’ve contemplated. And of course I wouldn’t have been able to experience without all the loyal FTT readers. So for that I thank you.